Unless the Independent Communications Authority of SA (Icasa) is able to issue new regulations to manage SA’s switch from analogue to digital terrestrial television by mid-October, the country will not be ready for the planned commercial launch of digital services in April next year. 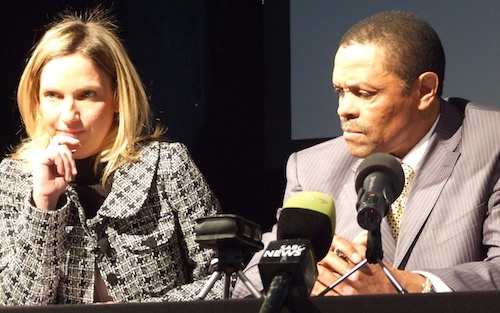 That’s the view of Lara Kantor (pictured above with communications minister Siphiwe Nyanda). Kantor is chair of the Digital Dzonga, an advisory council created by the department of communications to oversee the migration process. Icasa, facing a legal challenge from free-to-air broadcaster e.tv, will withdraw regulations it published last month within the next few days to allow a further period for comment from the broadcasting industry, a source close to the regulator says. But Icasa will have to move quickly to issue amended regulations if the entire migration process isn’t going to be delayed, Kantor warns. She says there are three hurdles which must be overcome urgently. First, Icasa must issue amended regulations to deal with e.tv’s legal threats; second, it must finalise the radio frequency spectrum plan for broadcasting; and, lastly, the SABC and e.tv must finalise the specification for the software to be included in the digital set-top boxes that will be required to receive digital TV signals. The two broadcasters have promised to finalise the specification by the end of September. Kantor won’t say if a delay would affect government’s target of switching off analogue broadcasts — and end the period of so-called “dual illumination” of both analogue and digital transmissions — by November 2011, though she feels that deadline is not feasible. It depends on how early people migrate to digital TV. If consumers leave the purchase of set-top boxes until the last moment, this could mean the date for full migration will have to be moved out. Experience in other markets suggests consumers leave buying set-top boxes until the last possible moment, though Kantor hopes that the new channel bouquets that will be available on digital will provide an incentive for people to switch earlier. In SA, where pay-TV penetration is relatively low, the value-added services offered by digital TV could entice people to switch earlier. Digital TV will offer them an electronic programme guide, similar to the programme guide available on MultiChoice’s DStv, additional audio tracks for different languages, and limited interactive applications. Though consumers can’t buy officially sanctioned set-top boxes until the commercial launch, it is already possible to receive digital signals. All that’s needed is a digital TV receiver capable of interpreting what are known as Mpeg-4 transmissions. But Kantor warns that these receivers won’t have the SA-specific software included, and won’t have a local electronic programme guide. During the test phase, nine digital channels are available to those who want to experiment with the service. E.tv is broadcasting its regular terrestrial channel plus a channel called “e.tv Classic”. The SABC is broadcasting its three regular channels — SABC 1, 2 and 3 — as well as channels focused on entertainment, natural history, education and children’s programming.